The question 'where in Canada do they speak French?' is a confusing one because while the country, itself, is bilingual, most provinces in Canada claim to be monolingual. There is only one bilingual province in Canada (New Brunswick) and one monolingual province whose official language is French: Québec. The rest of the Canadian provinces are monolingual English areas, at least according to the government. However, there are French speakers in these monolingual English provinces as well. Since all over Canada there are small populations of French speakers (in addition to the main areas where French is a majority language), the answer to the question 'where in Canada do they speak French?' is: everywhere. Of course, some areas have more French speakers than others. The Province of Québec only has one official language. Though French is the only official language, there are many places within the province where large populations of English speakers can be found, such as in the city of Montréal, and in certain neighborhoods of Québec City. Even though not everyone in Québec is a native speaker of Québécois French, this province still has, by far, the largest French-speaking population of Canada. Other provinces with large French speaking populations border Québec to the East (New Brunswick) and the West (Ontario). It's from this region that most of the Franco-Americans in New England came to America. New Brunswick is bilingual, like the country of Canada as a whole. In some parts of the province, one is more likely to bump into francophones, and in other regions, more likely to meet anglophones. Many people are actually bilingual French-English, and like many other areas of Canada, there are other languages spoken as well (most common are Mi'kmaq and Chinese). New Brunswick has more English speakers than French speakers (65 and 33 percent, respectively). 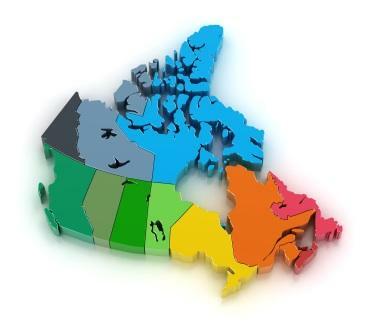 The provinces of Québec and New Brunswick are both official francophone areas, however, there are many more areas in Canada where French is spoken even though it is not one of the governmentally-recognized official languages. Ontario is one such area that has a large population of francophones. In Ontario, approximately 4.3 percent of the population is francophone and while that is a small percentage, it is the largest percentage of French speakers among the English speaking provinces. The largest numbers of francophones in Ontario can be found in the region of Ottawa, Canada's capital on the Eastern border of Ontario, and in Northeastern Ontario, also bordering the province of Québec. Ontario, in an effort to promote bilingualism in Canada, has many bilingual schools where native English speaking children are exposed to and learn French starting at an early age. There are also some small French-speaking communities in the western provinces of Canada. In Manitoba, a small francophone population exists, and in Alberta, approximately 2 percent of the population is native French speaking. In Nova Scotia some French speakers can be found, especially on Cape Breton Island. Another Canadian island where French is spoken is Prince Edward Island; particularly on the western side. French abounds in Canada, not just in the Province of Québec. Also, don't confuse the islands of St-Pierre et Miquelon with the rest of Canada. Though these small islands are geographically much closer to Canada than to France, these islands are still officially French territory, and, naturally, French is also spoken on these islands, but they cannot be considered French-speaking Canada despite their geographic proximity.